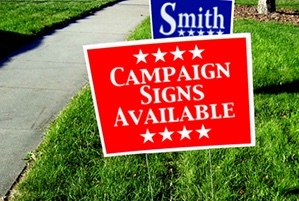 When searching for a short-term signage solution, yard signs are a practical, effective option. Designed with a bang for your buck mentality, these signs can be printed in full color for a fraction of the cost of other options. Make a BIG statement with your outdoor signage with our engaging, full-color solutions. We go far beyond basic yard signs to offer business, construction and real estate signage solutions.In addition to being a practical and effective way to promote your message, yard signs have a lot of curbside appeal. If you need to stop traffic and grab attention, talk to us about how we can help.